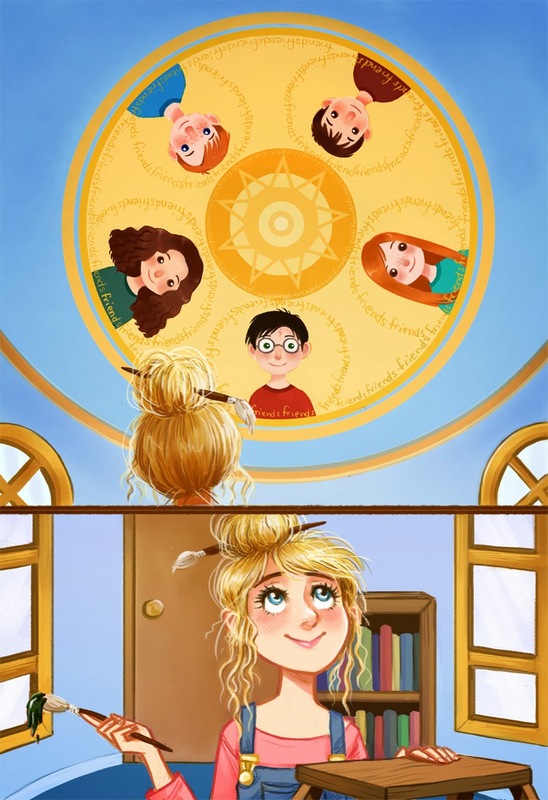 "Luna had decorated her bedroom ceiling with five beautifully painted faces: Harry, Ron, Hermione, Ginny, and Neville. They were not moving as the portraits at Hogwarts moved, but there was a certain magic about them all the same; Harry thought they breathed. What appeared to be fine golden chains wove around the pictures, linking them together, but after examining them for a minute or so, Harry realized that the chains were actually one word, repeated a thousand times in golden ink: friends…friends…friends…friends… Harry felt a great rush of affection for Luna"
This is beautiful. I have never read any of the Harry Potter books, but this is still really quite nice to see. At first I thought it was a picture of your friends. I had forgotten that Luna did this in the books. I think the picture is beautiful. wow, so adorable...Luna was my favorite character from the book.